With deliberately lit fires continuing (80 in the last week) and coming to symbolise a reckless lawlessness threatening the security of the town, a rearguard action on law and order issues by Aldermen Eli Melky and Murray Stewart crashed and burned last night. It was the Town Council’s end of month meeting. The public gallery was more than ordinarily full though not crowded. It included, significantly, MLAs Alison Anderson (Independent) and Adam Giles (Country Liberals), president of MacDonnell Shire Sid Anderson, controversial would-be Country Liberals candidate Leo Abbott, prominent activist couple Steve and Janet Brown, and outspoken general manager of Ingkerreke, Scott McConnell. In public question time at the start of the meeting Steve Brown put the issues on the agenda, asking council to discuss them in the open part of the meeting. He said he and others in the gallery were “thoroughly tired” of the “forum process”, alluding to this evening’s community feedback forum on the so-called Community Action Plan to combat crime and anti-social behaviour. The forum will be held by a government-appointed committee, co-chaired by Mayor Damien Ryan and local woman Catherine Liddle, and will consider the plan, said to be based on “the direction set by the community”, according to Minister for Central Australia, Karl Hampton. Mr Brown said there was no room for further forums, the time had come for action. He said he and those he was speaking for would not participate in tonight’s meeting, nor in future meetings likely to run through until the next election, as part of the government’s “propaganda machine”. Mayor Ryan said council would take Mr Brown’s request on notice and discuss it later in the evening. Policing in Alice Springs was on council’s agenda through the initiative of Alderman Rawnsley. The recommendation before aldermen was to write to the Chief Minister and Minister for Police, Paul Henderson, and the NT Police Commissioner John McRoberts to express the community’s concern about crime and anti-social behaviour and the need for the same level of police resources and focus to be in place this summer as was put in place (as a crisis response) last March. were part of the solution but not all. His amendment was seconded by Ald Stewart, who went on to undermine it by arguing in favour of the original motion while suggesting – too late for council processes – that there should be another stand-alone motion rather than the amendment. A likely ally, Ald Samih Habib Bitar, was absent, on personal leave. Nor surprisingly the amendment was defeated (voted against by all except Alds Melky and Stewart) and the original motion passed, with only Ald Melky voting against it, left sitting out in the cold after Ald Jane Clark called for a division. Undeterred, Ald Melky returned to the issue in Questions Without Notice, revealing that he had attempted to put a motion on the meeting agenda, with 11 “items” on law and order issues, but that it had been put into the confidential part of the meeting by acting CEO Greg Buxton (council meeting agendas are set by the CEO). Mr Buxton said he had made that call because he considered that discussing the motion in open would “prejudice the interests of the council”. Mayor Ryan took umbrage at Ald Melky’s suggestion of the possibility that Mr Buxton had conferred with him on the issue and Mr Buxton assured Ald Melky that he had not. Mayor Ryan said Ald Melky should put any further concerns in writing. Finally the discussion returned to the community feedback forum as requested by Mr Brown. Mayor Ryan opened, expressing his view that the forum will allow people to hear about what has happened as a result of a series of consultations held earlier in the year and will be a good opportunity to “bust myths” about what has and has not been done as a result. Ald Melky moved to suspend standing orders, which would allow a more free-flowing discussion. This was seconded by Ald Stewart, opposed by Ald Clark, but supported by the rest, including the Mayor. Ald Melky then challenged Mayor Ryan about chairing the committee. Is the committee more powerful than the council, he wanted to know. Would Mayor Ryan be representing the council on the committee, or was he on it in a personal capacity? How would he satisfy the expectations of the community in the role? Isn’t the council the best body to pass resolutions and lobby the government on law and order issues? And why hasn’t it done so? Mayor Ryan replied that the “passion” Ald Melky was showing on the issue had been shown by many others (240 of them) through the consultations. He reiterated that the forum was the opportunity to report back to the community. He said there are “small wins and big wins” that the community is looking for. He said “the future of our community has a lot to do with education and finding real jobs but that doesn’t help with summer”. For this summer, the community needs to hear what has been put in place by the Department of Children and Families, by police and for youth. Ald Stewart took up Ald Melky’s challenge to the Mayor, suggesting that “as the most powerful man in town” he was being compromised by being on a “push-through committee for government spin”. He expressed the same concern regarding the participation of Deputy Mayor Liz Martin. Ald Martin acknowledged the frustrations people were feeling about inaction but rejected Ald Stewart’s remarks on her participation as “insulting”. She said she would avail herself of any opportunity to be in a line of communication to government and would support the committee’s process “at this stage”. Ald Brendan Heenan, in his mild-mannered way, wanted to know from Mayor Ryan what he hoped to achieve from the committee. He also would have liked to see more Aboriginal people on it as well as people like John Adams, coordinator of youth services at the Youth Hub. Mayor Ran said Mr Adams will be present tonight to talk and answer questions about what is happening at the Youth Hub. After a bit more to-ing and fro-ing, standing orders resumed. Again Ald Melky entered the fray, attempting to have his 11 items on law and order discussed as Other Business. To do that he needed the majority support of other aldermen, but only got it from Ald Stewart. The open part of the meeting was over. As the public left, Ald Melky and Mayor Ryan were in a head to head, though Ald Melky soon joined the ‘no more meetings’ group lingering outside the chamber. Ms Anderson wanted to know why shire presidents were not invited to be on the committee and, for that matter, representatives of town camps: “It’s their children who are out there on the streets at night,” she said. Mr McConnell thought at the very least the committee should be bi-partisan, with MLAs Anderson and Giles – both of whom were very active in highlighting the problems last summer – asked to participate. And why not Ald Melky too, he asked, although at the same time, he was of the view that the time for committees was over: “It’s now up to the Chief Minister and Karl Hampton to do the work and deliver,” he said. 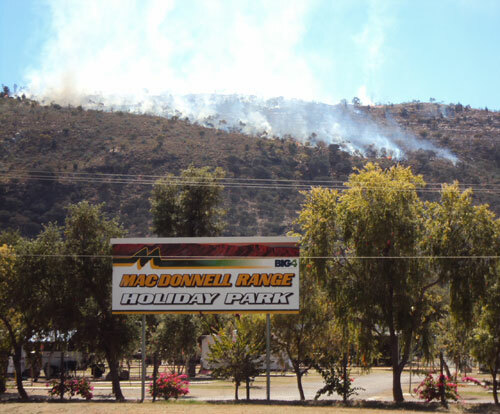 Pictured: Fire in the ranges above the MacDonnell Range Caravan Park on Monday. It and other fires burning along the range east of the Gap came from the control burn the Fire Service undertook on the weekend, to bring a maliciously lit fire on Undoolya Station under control. Senior Station Fire Officer in Alice Springs, John Kleeman, says these fires will be useful to reduce fuel load in the ranges and that there are major breaks between them and nearby infrastructure. Meanwhile, there have been 8o deliberately lit grass fires around town. Just so there is no confusion I would like to point out that our presence at this council meeting was in no way related to Ellie Melky’s Law and Order motion nor should it be seen as an attack on Council. We simply chose the Council Meeting as an appropriate venue to give voice, “put on the record,” our objection to the continuance of the Forum process as we believe it to be nothing more than a “look at me I’m doing something exercise”. Council was chosen as the Mayor and Deputy Mayor were to chair the meeting. What should be of more interest to your readers is that the group attending along with those supporters who couldn’t make it on the night represented almost the entire conservative vote in the Alice. The significance of our withdrawal from the meeting is that such a gathering could not be seen as a Community Action without our participation. That was the entirety of our message. We were however pleased to receive backing from alderman Melky and Stewart though somewhat gobsmaked by Alderman Melky’s then attending and participating in the meeting he had publicly agreed to boycott the night before. I suspect Mr Melky may find less difficulty with his credibility before Council if he displays a level of consistency capable of sustaining more than one night.